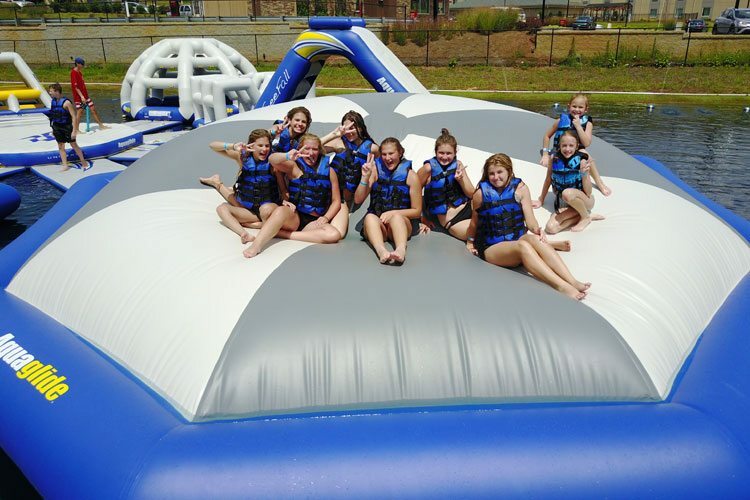 Host your birthday party, team event, or spirit night on our Aqua Park! Just pay per participant (per session). $15 per person on weekdays, $20 per person on weekends. Groups of 10 or more receive a 10% off group discount! Call to reserve the spots you need, or reserve the whole session for a private event. Want to reserve the cable lakes for a group party? Terminus Wake Park is the perfect place to host company parties, fundraisers, corporate outings, team building days, etc. The park will operate in the case of rain, but will shut down temporarily if lightning is within 10 miles of the property. In the case of a lightning delay, all passes are frozen until lightning is outside of 10 miles and the park reopens. If the park has to shut down for the rest of the day due to weather, raincheck passes will be issued, but participants must be present to collect their issued raincheck.